Each year, gardeners keep a “weather-ear” out for predictions of that first hard frost. An early frost can stop the clock on plants before their time, long before you’re ready to say “goodbye” to your annuals or even “sleep well” to your perennials. On the flip side, a late killing frost in the spring can nip your hopes for emerging plants in the bud. During the day, plants and soil absorb and store heat from the sun. As day turns into night, plants quickly begin to lose all their stored heat. Then, if temperatures drop enough, moisture freezes on plant leaves and buds. Clouds can help insulate and slow the loss of heat, but a clear, wind-free night will afford no protection from frost. The temperature within the soil and in the plant’s cells may even drop to a few degrees colder than the air. Softwoods, actively blooming, and potted plants are the most susceptible to frost damage. The telltale signs are usually visible within two to three days. Browned, mushy leaves and buds sadly greet the unprepared gardener. The best way to cope with the effects of a sudden freeze is to plan ahead and have plant protection at the ready. Portable, potted plants can be brought into sheltered areas. Plants in large, heavy pots, and those growing directly in the ground, however, need to be covered. Your first inclination may be to grab a vinyl tarp or plastic trash bags. Not the best idea. Plastic or vinyl materials are normally too thin to provide adequate insulation. Since they do not breathe, moisture can get trapped inside. 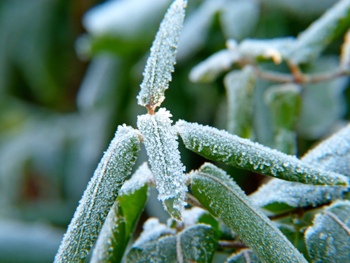 If temperatures drop low enough, this moisture will freeze on your plants, causing more harm than good. Instead of plastic, use natural fabrics like cotton or linen, an opened burlap bag, or newspaper. These materials are thick enough to provide insulation, but allow enough ventilation for moisture to escape. Commercial coverings may be purchased, but you probably already have materials around the house you can use. Bed sheets, for example, work well for covering large plants and shrubs. 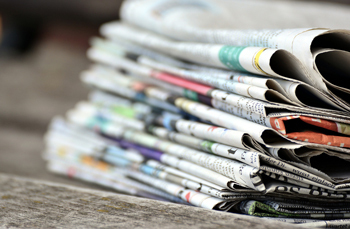 Newspaper can be used on low-growing foliage, but won’t stay on top of larger plants well. The important thing is to cover the plants before sunset and be sure the covering reaches the ground beneath the plant. This way, warmth absorbed into the soil during the day is trapped inside the insulating protection. And remember, frost can even occur in normally frost-free areas, so always pay particular attention to fall and spring weather forecasts. Although he was referring to 18th century fire safety, the words of Ben Franklin hold true for plants, as well. “An ounce of prevention is worth a pound of cure,” so have your plant covering strategies ready to go! Other ways to help your garden survive a frost. The best way to avoid frost damage to your plants is to grow plants that can withstand the frost. The term â€˜frost hardy' is often misleading because of the degrees of frost (i.e., light frost vs. hard, killing frost). It is a good idea to ask a qualified local nurseryman what is suitable to grow in your area. 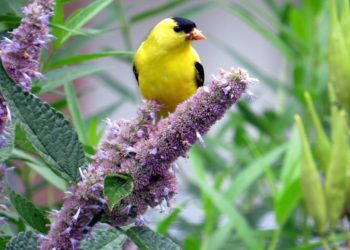 Even better, look around your own neighborhood, and see what survives and thrives in other yards and gardens. Choose varieties of plants that flower late, in areas where late spring frosts may occur. Some annual and perennial plants will survive frost on the foliage, but the same frost might kill any flower buds that have emerged. Cold air is denser than warm air, so it sinks to the lowest point. Low-lying areas of the garden can be several degrees colder. Consequently, frost may occur in these areas when there is no frost evident anywhere else in the garden. Plant tender species on higher ground or on slopes where the cold air will flow past the plants as it moves to the low point. Any sloping area is less prone to frost, because the cold air won't settle there as readily. Precondition your plants to withstand cold temperatures by discontinuing fertilizing in early fall, so that no new foliage is on the plant when cold temperatures arrive. Older leaves are much tougher and more able to withstand frost. Water your plants thoroughly before nightfall. The soil will release moisture into the air around your plants during the night, keeping the air somewhat warmer. Even a slight breeze will prevent cold air from settling near the ground during the night. You can help keep frost from forming by providing this breeze with an electric fan. Be sure to protect the fan and all electrical connections from moisture and the elements. Cover up before dusk! By the time it gets dark much of the stored heat in the garden has already been lost. If you have time, build a simple frame around the plant, or row of plants. (Even a single stake can be used in many cases.) Then drape a cover of newspaper, cardboard, plastic tarps, bed sheeting or any other lightweight material over the frame to create a tent. If you don’t have time to create a frame, lay the protective cover directly onto the plant. This will help to slow the loss of heat rising from the foliage and the ground. Remove the covers in the morning, once the frost has disappeared, to let the light and fresh air back in, and to prevent overheating by the sun. For smaller, individual plants you can use glass jars, milk jugs with the bottom removed, paper cups turned upside down, or flower pots as heat traps. Don’t forget to remove these covers in the morning. You can collect heat during the day by painting plastic milk jugs black and filling them with water. Place them around your plants where they will collect heat during the day. Water loses heat more slowly than soil or air. This collected heat will radiate out throughout the night. Potted plants are particularly susceptible to frosts because the roots are less insulated. If you are unable to move your container plants indoors or under cover, remember to also wrap the pot in burlap or bubble wrap, or simply bury the pot in the ground, in addition to protecting the foliage. If your efforts were too late, or too little to protect your plants from a frost, resist the urge to cut off the damaged parts of the plants. To a certain extent, these dead leaves and stems will provide limited insulation from further frost damage. Your plants will still need to be pruned in spring. When covering plants for frost, do I leave the frost protection bag on my plants all day or do I take it off in the morning? Dear Ann, covering plants for frost is very simple. The night before the frost is expected, cover your plants. The next morning after the sun has risen, you can remove your plant covers. You continue this until the weather turns cold enough that the plant dies down for the year season. I have a friend when it gets 32 degrees and below, run his yard sprinklers to put a coating of ice on the plants. What does this ice coating on the plants do to protect the plants? Is it better than covering them up? I gotta think it’s harder on the sprinkler system than the plants! According to the US Dept. of Energy, depending on how long the temps maintain freezing and below, this is not harmful. Why? Well, the water in a liquid state has to undergo a physical change to transform to a solid. When it freezes it gives off heat energy during that transformation. Once the freezing process stops, the ice will fall to ambient temperatures, so an extended period of freezing would require a continued spraying. The extended spraying, however, would create an increased amount of weight from the ice load, risking damage to the plant from breaking branches. But in addition to the energy released during freezing, two other reasons apply. Ice has a low thermal conductivity, especially if sprayed on in the form of a “snow” and the ice/snow helps to protect the plant from wind, which will wick moisture and heat away (that dreaded “wind-chill” factor). It’s why igloos work or why you burrow into the snow when caught in a snow storm. If you don’t want to water your plants in the freezing temps, make sure that the ground has sufficient moisture by watering the ground around the plants. If you have had a period of drought, your plants may already be stressed and less able to endure a sudden freeze, so in general keeping moisture consistent at the root level is also important. plants with cotton fabric or plastic to protect against cold and frost is a simple physical barrier against the elements, but be sure to remove in the mornings so sunlight can warm the soil and air can circulate around the plants. Can plant blankets stay on the plants to protect them from frost for a few months without removing them, or should I remove every day? Jan that is a good question and one that needs some more information to answer fully. If your blanket is covering something like a hydrangea or semi-hardy shrub, you put them on after there has been sustained cold and leave them on. Depending on your location that could be anywhere from now until the first of the year. I have some that cover a couple hydrangeas but I do not completely seal them up or fill with leaves until we have consistent temps in the 40s and below in the daytime, usually late December. If you’re covering cool-season, late fall crops then it would be best to remove or at least open them during warmer, sunny days so you don’t run the risk of overheating the plants. They could be left on if the days are cold and blustery. I would treat them similarly to cold frames, just not letting interior temps get too high. The blankets are designed to keep the frost off the leaves but will only do so for a short period; once the weather turns really cold the ambient air under the blanket will be too cold and the blanket can no longer protect the plants. The best way to protect plants from a hard freeze is to build some sort of frame, PVC works great, to keep the fabric off of the plants. Plants tend to burn where the fabric comes into contact with them. For prolonged frosts or hard freezes the best thing to do is to cover the plants and build a tent like structure to keep as much breeze out as possible, then put a spotlight underneath to increase the temp inside the tent. Fabrics that breathe work best like cotton or frost cloth. I have burlap covering my plants, do I need to take the covers off during the day. Since I am unaware of the location of the tree or its circumstances, I can offer only some general advice about protecting subtropicals from frost. If the plant is in the ground, then overhead protection, such as a frame over the plant covered with fabric, will provide additional protection during freezes, and electric lights can be included for added warmth. We sell some excellent options for plant covers. Potted plants can be moved to a more protected site if necessary. The best option is planting on the warm side of a building or structure to provide some frost protection for guavas in cooler areas. I hope that helps with your tree. I bought these from your site the first time last year after losing plants from ice here in OK. I won’t ever be without them again! I used them according to your recommendations and then dried and aired them out before putting them in storage. I didn’t lose any plants last year and I’m about ready to have to get them out of storage again and I think I’ll order a few more. They are well worth the little I paid for them. Thanks! We live in Las Vegas and have a couple of cacti (organ pipe and Peruvian Apple) that can be hurt by frost when our temps get to 32 or so a few times during the winter. I cover these with burlap and leacve the burlap on from late November unitl late February when it begins to warm up. It works fine. My bogainvillas I cut back then cover with burlap and leave on all winter (2.5-3 months) with no negative effects. The pigmy date palms we have near the front entrance are especially suseptable to cold. I bought 6’x5′ commercial covers (appear to be made of Tyvek-like material)and only drape those over the palms (7′ high by 6′ wide) on evenings when temps are to go below 34F. This works well. I have installed hooks on the ground to hold the covers should it get windy. When protecting plants from frost with bed sheets, do you have to uncover frequently or can the cover be left on the plant? Bed sheets are great temporary covers for frost protection in the late fall and early spring but they don’t make the best covers for a long-term basis. The fabric is generally not porous enough to allow sufficient air circulation and when wet could become too heavy and cause stems to break. During the period of the seasons when patchy frost happens, cover the blooming, or pre-harvest plants in the late evening before the frost occurs but remove the sheet in the morning as the sun comes back up. Recover the next evening if needed. Spraying the plant with water prior to covering is also helpful for short-term protection. For all-winter protection of tender perennials and shrubs, use either our Natural Burlap or other specially-made plant protection fabrics. Can strings of little white Xmas lights strung around a potted Bird of Paradise plant be enough to protect them from freezing? Christmas lights, if enough were used, may protect from light frost; however they will not stop a freezing issue. Have you tried the Grow it Now! Plant Protector? It is a miniature greenhouse that you put over your plants, anchor it down with garden staples and pile dirt up the sides. You leave it on the plant for the first 4 – 6 weeks, it promotes and stimulates germination, protects against heavy wind, rain, snow and cold weather temperatures. 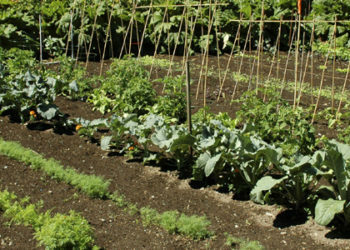 We planted our spring 2011 garden using the Grow it Now! Plant Protectors and were able to start our cold-hardy crops as soon as the soil could be worked, for southeast Idaho that was March 19, 2011. We were harvesting 9″ broccoli and cauliflower by June 13, 2011. Our tomatoes we started the first of May when around here you are nuts to start them any earlier than memorial day. We had the most bountiful harvest of tomatoes we have ever had in our 15 years of gardening here in Idaho. I highly recommend the plant protectors and hopefully it will save you some time only putting them on once and leaving them on for the first 5 weeks. Will the plants covered to protect them from frost/snow survive if no light is on them for a few days? Or do you remove covers even if temp is below freezing? Yes your plants will survive for a couple days being covered. Covers do well for frost; however you should keep in mind that they only give a couple of degrees protection against freezing. I live in Iowa and deal with frost often. Daytime highs are now 40's and night time lows are 25 to 38's. Because the frost is hitting early this year I am trying to keep them safe from frost until I can harvest the produce. (Tomatoes and peppers) I came up with the idea of covering the plants with thick plastic first and then blankets. I remove the blankets somewhat during the day and pull them back on each night when needed. Then the plastic can stay on during the day to keep some of the heat in. Is this a good idea or am I wasting my time with this method? 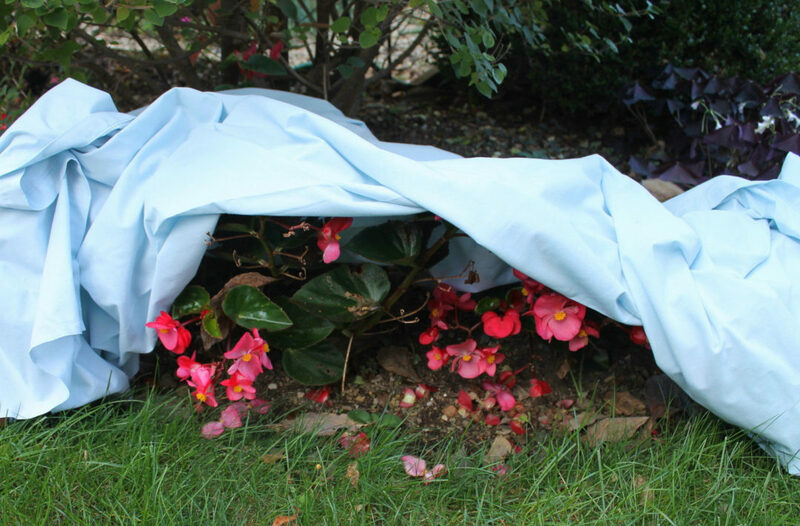 If you do not have a frost cover, you can certainly use an old bed sheet and drape it over the plants. will a covered porch suffice for hanging plants? Moe, anything that is hanging over the plants will protect it from frost. Darold, laying the sheet over the top would be fine for frost. If the temps drop below 33, you would want to put a heater underneath as well. Plastic is not an effective method for protecting plants from frost. Plastic has no thermal resistance; which means that although it stops air movement, it does not keep heat around the plant. The frost will effect your plants wherever they touch the plastic. Old sheets, lightweight blankets or newspaper will effectively protect your plants against frost. Catherine, you are correct. Plastic is a poor method of covering plants in harsh weather. 1. Lay down flat on the ground tote bags filled with thermo-cole around the twigs, and place some heavy firewood on them. This is to keep the top soil warm. 2. To wrap-up the plant with soft cotton cloth from base up and leave it there for the entire winter. 3. Run a hose pipe to the base of the plant under the tote bags to water the plant periodically like once in 10 days. Not sure whether the residual water in the hose will freeze and burst it. Would that help save the plant? Mango plants may survive the New Jersey harsh winter weather indoors but I’m not sure about outdoor especially when it is rooted directly into the ground soil and not in a pot or container. We use old mattress pads and old drapes in addition to bed sheets to cover our tomatoes when there is a threat of light frost. Put them on in the afternoon/early evening and then when the weather is nice (hopefully the next day), we take the covering off. With threat of hard frost, we pick everything first and consider it the end of the season. I read somewhere to use moving blankets. What are your thoughts? Hello Gardeners! I have 2 hydrangeas that I have to cover for occasional frosts in SC. With the fragile buds on the tips of the stalks, it was a risky business draping them with cloths. My solution was to pound a big umbrella, the kind you use at the beach with a pointed tip, into the ground and put a cloth over that or clipped around the edge. Liberal use of clothespins help hold it all together. One bush is large, I have to use a PVC pipe and a golf umbrella. This works very well in protecting the plant without damaging buds. I have stakes around my immature Hydrangeas and plan to drape old bed sheets across the staked-off areas so the sheets are held off the plant tips. Is it just the branch tips that need to be protected, or should I cover the base of the plants also? We are expected to hit 26 degrees tomorrow nite. Thanks. Think about it, on a cold windy day would you rather be wearing a plastic garbage bag or a sheet? Cold air will go right through the sheet. The plastic keeps the cold air out and only allows heat transfer by conduction rather than convection. If you’ve used a convection oven or are familiar with wind chill you know that convection is much more effective at heat transfer than conduction.